My life has been full of happy acts of serendipity – making wonderful discoveries when, in fact, I had started out looking for something else. 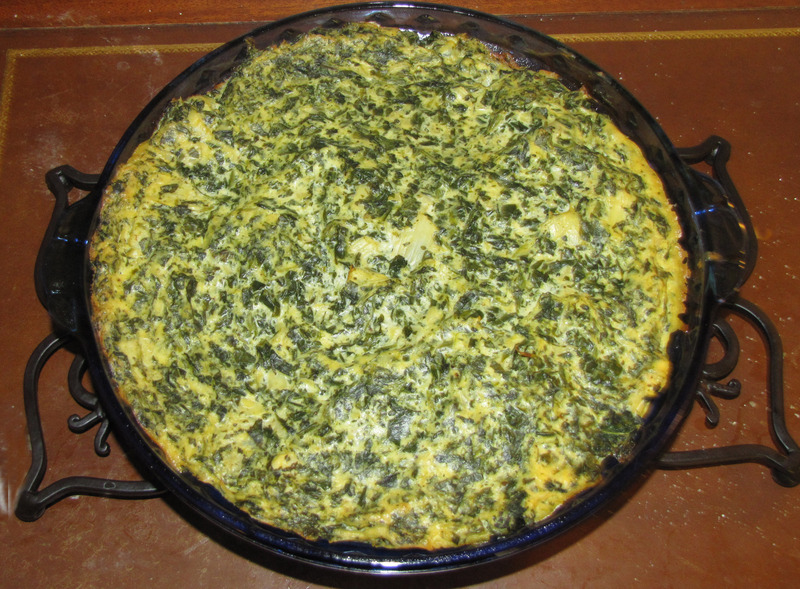 Latest case in point: this low-cal, egg-free, dairy-free, gluten-free Artichoke Spinach Quiche. It was supposed to be an artichoke spinach dip, from Alicia Simpson’s book Quick and Easy Low-Cal Vegan Comfort Food. I’m sure it was some sort of error on my part, as I’ve had great success with Alicia’s recipes before. Perhaps I used too much spinach (a 10 oz. package was called for; I used about 3/4 of a 16 oz bag. Or perhaps my my oven burns a little hotter than Alicia’s. But when I took the pan out of the oven, the dip was – well, not very diplike. Kind of solid, in fact. Not spreadable at all! In fact it seemed more like a quiche! Not only did it look like a quiche, it tasted quiche-like as well! A few very small tweaks here and there, a slightly longer cooking time – and voila! My new favorite breakfast or brunch! And, if necessary, you can cook the quiche the day before, refrigerate overnight, and heat individual slices the next morning in the microwave – it’s still good. Preheat oven to 375 degrees and spray a 9.5 inch pie pan with nonstick cooking spray or mist lightly with oil. Chop the artichokes or pulse briefly in the blender. You don’t want a mush; just small pieces. Remove and set aside. Combine the silken tofu, garlic cloves, minced onion, canola oil, nutritional yeast, salt, pepper, and lemon juice in the blender. Blend till smooth. Drain excess water (if any) from defrosted spinach. In a large mixing bowl, stir the artichokes and spinach together. Pour the tofu mixture on top and mix well. Pour into pie pan and bake for approximately 40 minutes, or until top is just lightly browned. To make this more like a traditional quiche, use a vegan pie crust. Whole Foods offers a vegan version, and the Harris Teeter store brand also appears to be vegan. Beware – most of the Pillsbury pie crusts contain lard. I usually prefer to forego the pie crust to save calories. If you slice the quiche into 8 pieces it’s 119 calories per serving; if you slice it into 6 more generously sized pieces it’s 159 calories per serving. Thanks! I’ve seen recipes for vegan quiche before, but most of them called for Daiya cheese and I’m not a big of those processed vegan cheeses. That’s good. Yes I prefer making food from scratch and not using processed food ..
when I read quiche in the title of the post, I was expecting an egg replacer (which I quite don’t like) in the recipe 🙂 This is truly amazing and looks delicious. It’s really very good. I can’t stop eating it. 😀 I know what you mean about egg replacers; I use them when making a pan of cornbread or something like that, but I think it would be just WEIRD in a quiche! I”ve also seen quiche recipes that call for cups of Daiya cheese and (barf) I don’t like Daiya cheese either! I’m much more comfortable with ingredients like tofu and nutritional yeast. Happily I cooked this dip for too long, and it got kind of solid, and I’m calling it a quiche, and I’m eating it 🙂 Please, someone stop me before I bake this quiche AGAIN! It’s extremely easy! If you make it, let me know how you like it! Savory Spinach Dip (Raw, Vegan) : Be Fit, Healthy, Happy!